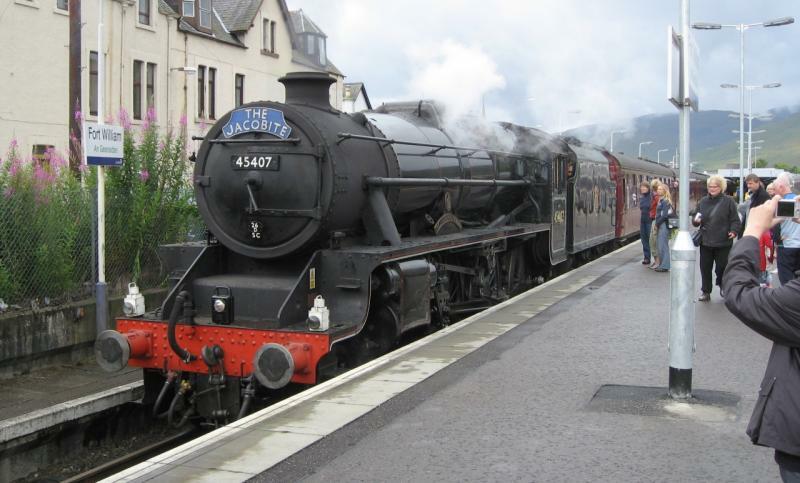 The Jacobite is the name of the summer service between Fort William and Mallaig using steam locomotives. This steam train has been running since 1984; in the later British Rail days it was known as The Lochaber. Since 1995 it has been operated by West Coast Railway Company. The locomotive usually runs chimney first to Mallaig, and returns tender first to Fort William. After arrival at Mallaig platform 1, the locomotive runs round the train, then shunts the stock into platform 2. After departure from Mallaig (plaform 2), the train pauses briefly outside the station for the Ground Frame to be reset, before the train proceeds to Glenfinnan. The return train also stops at Morar because of the Open Level Crossing. The train leaves Fort William at 10.15, arriving at Mallaig at 12.26. It leaves Mallaig at 14.11, arriving back at Fort William at 16.03. Running Monday 14th May - Friday 26th October 2012. The service will run Mondays to Fridays throughout, and Saturdays & Sundays, 23rd June to 26th August 2012. Created by Dysgraphyk and last modified by RyanM at 22:46, 27 of September 2012.